Horse farm with arena providing boarding and riding lessons. Find information about the services and facilities, riding lessons, news and events. Information on beginner western riding lessons taught by a nationally certified instructor, Letty Hise. Lists pricing. Horseback riding lessons on Long Island. Indoor arena for all types of weather. Includes description of services and photos. Full service riding facility with training by a Kenny Harlow certified trainer, and full-care board. Offer riding lessons for any age, discipline, and level of riding in Bucks County. Lessons in Cabo San Lucas. Also, horseback riding tours along the beaches. Information and directions. Highlights stable and horseback riding lessons available. Includes rates and directions. Farm offers riding instruction, boarding facilities and training. Facilities include barn, riding ring, pastures with run-in sheds and over three miles of riding trails. Site has information on lessons and costs. Located in Culpeper. Highlights stable and horseback riding lessons available. Includes rates and directions. Located in Quincy. Riding lessons, bording, and riding facility located on a 20-acre American Saddlebred Farm in Indian Trail. Offers boarding, training, English and Western riding lessons, plus dressage and jumping, and breeding. Also rentals and riding trails. Offers horseback riding, lessons, and group events. Includes list of services and photos. Located in Kissimmee. Offers boarding, riding lessons, driving lessons, and training. Includes list of services and photos. Located in Exeter. Offers horseback riding adventure vacations, riding lessons, and sleigh rides among the panoramic mountains and hillsides of Quebecs Gatineau Hills. Riding lessons, focusing mainly on English riding (including jumping), training, and boarding in Copperopolis. Fees listed. Pictures and pricing of horse show ribbons for sale. Offers riding lessons, horses and ponies for sale, and listings of each. Information on therapeutic riding program and online horse trivia. Located in Chelmsford. Offers lessons, training, trail riding, and summer camps. Includes description of services, rates, FAQs, and photos. Located in River Falls. Breeds Peruvian Pasos, as well as providing boarding, training, and riding lessons. Includes available stud Pasos. Offering boarding, training, and English and Western riding lessons by a ARICP Certified Instructor. Also clinics and summer camp for both kids and adults. Located in Hancock. If the business hours of Centerline Riding Academy in may vary on holidays like Valentine’s Day, Washington’s Birthday, St. Patrick’s Day, Easter, Easter eve and Mother’s day. We display standard opening hours and price ranges in our profile site. We recommend to check out centerlineridingacademy.com for further information. 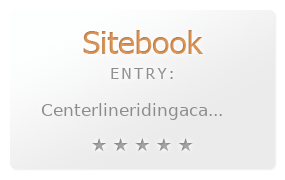 You can also search for Alternatives for centerlineridingacademy.com on our Review Site Sitebook.org All trademarks are the property of their respective owners. If we should delete this entry, please send us a short E-Mail.